Location: Blessington, County Wicklow, Ireland. Notes: Threecastles Castle is a rectangular three-storey tower house, with a stair turret projecting from the north east corner. Originally there was a structure attached to the west side of the tower, as the remnants of a barrel vault are visible. Another vaulted roof is evident on the upper floor. On the first floor has a fireplace and a gardrobe. The walls are four to five feet thick, and are faced with cut granite. The castle sits on an east facing slope overlooking a ford on the River Liffey. 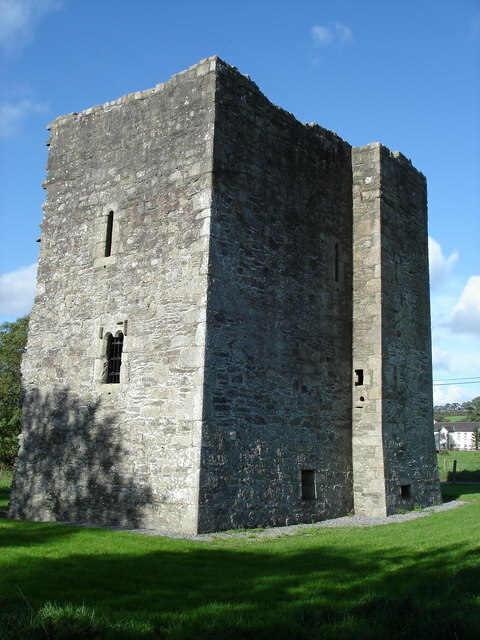 The history of the castle is unclear, but it is believed that due to the castle's name there were more than one castle in the townsland. Of the other two castles, the site of one is known from a 19th-century Ordnance Survey, the third castle's site is unknown. It was probably built by Lord Deputy Gerald Fitzgerald, 8th earl of Kildare, in the 16th-century. It was the site of a number of battles in the 1500s. Though some speculate that the three refers to the castle having three parts.